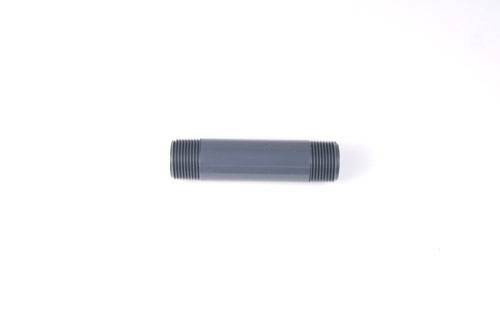 The Drip Store's 1/2" diameter MNPT X 4" in length sch. 80 PVC riser is used to connect underground pipes to sprinkler heads, retrofit drip heads, or any other drip irrigation components supplied by underground PVC lines. The Drip Store's Schedule 80 PVC threaded risers are available in various sizes and lengths and are designed for use in any application for home, commercial landscape and agricultural irrigation. This riser has 1/2" MNPT on each side and is 4" in length. Made from durable, gray color schedule 80 molded PVC plastic, with male threads on each end for connection to a subsurface PVC tee or elbow with female threads. Once the riser threads are exposed above ground, connect the sprinkler head or retrofit adapter (such as model A008) for connecting drip irrigation equipment.